There is an ongoing war in our society to remove Christ from Christmas, but did you know that Christ’s birth was actually a declaration of war by God? Christ’s birth was God’s opening salvo in a war that ultimately leads to victory over sin, suffering, death, and Satan (see Revelation 12). 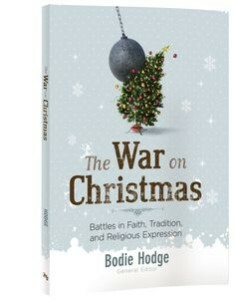 Bodie Hodge, the general editor of a new book entitled, The War on Christmas, will join us this weekend on The Christian Worldview to talk about these two wars over Christmas — the world’s war and God’s war. We will also discuss interesting questions surrounding the history and significance of Christ’s birth, along with God-honoring ways to celebrate it. We hope you can join us this weekend before Christmas to set our minds on the reason for the season — Jesus Christ, the Son of God and Savior of mankind!